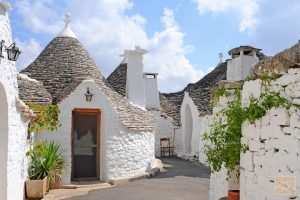 We are pleased to announce our Gourmet Getaway Tour for 2019 to Puglia and Basilicata, Italy!! Together we will uncover the bounty to Puglia’s agricultural heritage and fine artisan food traditions from capocollo and burrata to the sun-kissed produce of the Salento. We’ll sample prized Extra Virgin Olive Oils crafted from ancient varietals and sip luscious Primitivo di Mandruia vintages, before exploring the enchanting towns of the Valle d’Itria. We’ll cook typical Apulian cuisine in the Baroque masterpiece of Lecce, then travel to the otherworldly landscapes of Basilicata to experience Matera with its antique baking traditions and honeycomb network of mysterious sassi caves. For a detailed itinerary, click here or here. The Olive Tree and the Grape Vine – are ancient symbols of peace, sustenance, and merriment. Our primary products are fine extra virgin olive oils and balsamic vinegars, fruits of the olive tree and the grape vine. Our guests are invited to taste all of our olive oils and balsamic vinegars and after choosing their favorites, we hand bottle selections in an attractive bottle with a bar top cork and a wine-bottle type foil as a final seal. We’ve found that our customers love giving our products as gifts, so we happily create gift baskets, offer lovely gift bags, and shipping. How are we different from other olive oil tasting shops? We are completely independent! We are not a franchise, nor do we have any contracts with any distributor or any particular grove or supplier. We buy our products from the very best source we can find—and we can change our products whenever we find one we feel is better. We also change our products a bit to reflect the season. We support local and entrepreneurial businesses whenever we can. While our products are Mediterranean inspired, many have strong ties to our area. We are also conscious of the environment. We use recycled paper products, and encourage our customers to return with a formerly purchased bottle for a discount on their purchase.